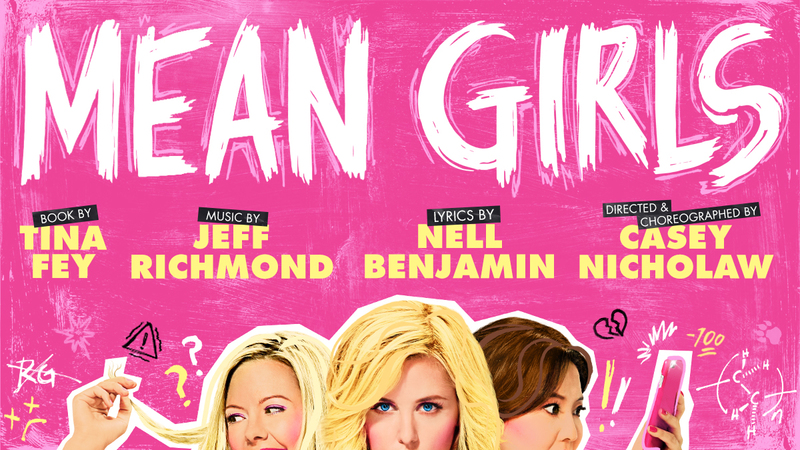 Purchase tickets to Mean Girls online, at the theatre box office, or by calling 877-250-2929. Designed by architects C. Howard Crane and Kenneth Franzheim and constructed by the Theatre Guild, it opened as the Guild Theatre in 1925 with a revival of George Bernard Shaw’s Caesar and Cleopatra. In 1943, the building was leased to WOR-Mutual Radio as a studio. The American National Theater and Academy purchased it in 1950 and renamed it the ANTA Theatre. In 1981, the theatre was purchased by Jujamcyn Theatres and named the Virginia Theatre for owner and Jujamcyn Board member Virginia McKnight Binger. After Virginia’s husband James H. Binger’s death in 2004, producer and president of Jujamcyn Rocco Landesman announced that he planned to buy Jujamcyn. On October 16, 2005, 14 days after American playwright August Wilson’s death, the theatre was renamed in his honor. Notable productions in this theatre include Our Town, Cat on a Hot Tin Roof, On Your Toes, Carrie, City of Angels, My Fair Lady, Smokey Joe’s Cafe, Little Shop of Horrors, and Jersey Boys. 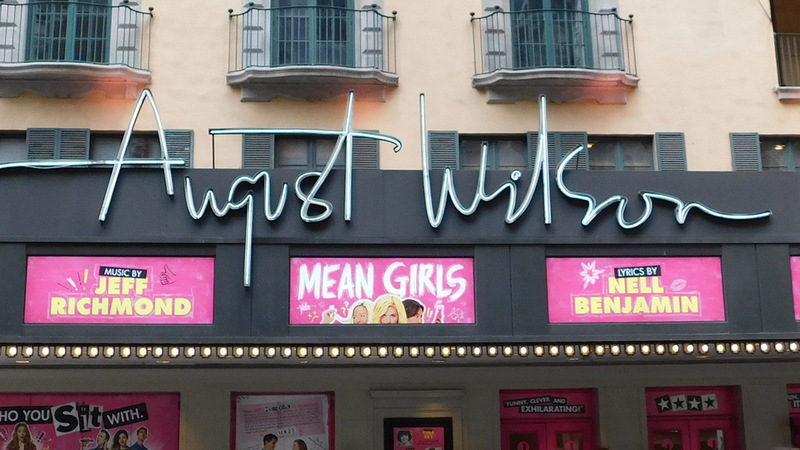 Mean Girls is currently playing at the August Wilson Theatre. The August Wilson has 1,275 seats and is one of Jujamcyn Theaters’ five Broadway theatres. Cash, Visa, Mastercard, Discover, and American Express are accepted. Mean Girls is recommended for ages 12 and older. Everyone requires a ticket for entry. 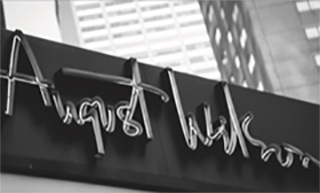 Join us at one of the August Wilson Theatre’s bars. Located on the main lobby and Mezzanine lobby, our bars are stocked with a range of cocktails and nonalcoholic beverage choices, which you are welcome to take back to your seats. Don’t forget to pick up a snack! The restrooms are located in the main lobby. The accessible restroom is located on the house left side of the Orchestra level. If you have a bag or large coat, we’d be happy to check it for you. The coat check is located in the main lobby. The charge is $3 per item (no furs, please). The August Wilson Theatre is not completely wheelchair-accessible. There are 8 steps down into the main entrance of the theatre from the sidewalk and 25 steps up from there to the Orchestra level. However, there is an entrance via a Stair Lift that provides direct access from the entrance on 52nd Street to the Orchestra level. A person does not have to be confined to a wheelchair to use the lift. The Stair Lift does have a weight capacity of 500 pounds. Upon arrival, please contact the uniformed porter on duty in the Outer Lobby who will usher you to the Stair Lift. If the porter is not present in the Outer Lobby, please ask the Box Office personnel to contact the manager. The Box Office is on the street level. If you require assistance, the porter will be available to help you with the operation of the lift before and after the performance. There is a wheelchair accessible unisex restroom located near the upper landing of the Stair Lift in the Orchestra. All other restrooms (not wheelchair accessible) are located in the Lower Lobby, one flight down from the Orchestra. Seating is accessible to all parts of the Orchestra via steps. There are 25 steps up from the main entrance of the theatre to the Orchestra level. However, there is an entrance via a Stair Lift that provides direct access from the entrance on 52nd Street to the Orchestra level. See Access Information above. Wheelchair seating is in the Orchestra only. Located on the second level: up 16 steps from the Orchestra. There is an additional six steps up from the Mezzanine lobby to the Mezzanine entrance (located behind row E), and an additional 19 steps up to the remainder of the Mezzanine. Please note: On the Mezzanine level, there are approximately two steps up/down per row. Reservations are not necessary. Driver’s license or ID with printed address required as a deposit. Built in 1925 by the prestigious Theatre Guild as the Guild Theatre, it was officially opened by President Calvin Coolidge, who pushed a button to turn the stage lights on for a production of Caesar and Cleopatra starring Helen Hayes as the Egyptian queen. This house was later named the ANTA, and, from 1981, when it was acquired by Jujamcyn Theaters, the Virginia, in honor of Virginia M. Binger, owner with her husband, James, of Jujamcyn Theaters. On October 16, 2005, the theatre was renamed the August Wilson Theatre, honoring the late playwright for his incomparable contribution to the American theatre. Groundhog Day played here in 2017, after the long-running hit Jersey Boys closed. Prior to the arrival of Jersey Boys (4,642 performances), productions included Little Women, Little Shop of Horrors, Bill Maher: Victory Begins at Home, Flower Drum Song, The Crucible, King Hedley II, The Best Man, The Wild Party, and Smokey Joe’s Café. Before the successful revival of My Fair Lady starring Richard Chamberlain, this theatre housed Gregory Hines in the hit musical Jelly’s Last Jam; the Tony Award–winning musical City of Angels; a revival of Shenandoah; the British farce Run for Your Wife; the musical Carrie; a Canadian production of The Mikado; Ian McKellen in Wild Honey; Execution of Justice; the hit revival of Rodgers and Hart’s On Your Toes; Oh, Brother! ; Copperfield; and Derek Jacobi in The Suicide. Productions in the 1970s included a memorable revival of Mary Chase’s Harvey, starring Helen Hayes, James Stewart, and Jesse White; appearances by the dance companies of Alvin Ailey, Louis Falco, Pearl Lang, Paul Taylor, Nikolais, and the Dance Theatre of Harlem; Julie Harris winning a Tony for The Last of Mrs. Lincoln; Elizabeth Ashley, Keir Dullea, Fred Gwynne, and Kate Reid in a revival of Tennessee Williams’s Cat on a Hot Tin Roof; the exuberant musical Bubbling Brown Sugar, which ran for 766 performances; Charles Repole in a revival of the 1920s musical Whoopee! ; and Maggie Smith in Tom Stoppard’s Night and Day. Highlights of the 1960s included Hugh Wheeler’s Big Fish, Little Fish with Jason Robards Jr., Hume Cronyn, Martin Gabel, Elizabeth Wilson, and George Grizzard; Robert Bolt’s A Man for All Seasons, which won four Tonys; James Baldwin’s Blues for Mr. Charlie, directed by Burgess Meredith; Diana Sands and Alan Alda in The Owl and the Pussycat; Peter Shaffer’s The Royal Hunt of the Sun; A Thurber Carnival, with Tom Ewell, Peggy Cass, Paul Ford, and Alice Ghostley; and a revival of Our Town with Henry Fonda, Ed Begley, Harvey Evans, Mildred Natwick, and Margaret Hamilton. In 1950 this theatre was extensively renovated. The 1950s saw productions of The Tower Beyond Tragedy with Judith Anderson; Twentieth Century with Gloria Swanson and José Ferrer; a revival of Thornton Wilder’s The Skin of Our Teeth with Mary Martin, Helen Hayes, George Abbott, Florence Reed, and Don Murray; Say, Darling starring Robert Morse; and Archibald MacLeish’s Tony- and Pulitzer-winning play J.B., starring Raymond Massey and Christopher Plummer.